Ari has body-image issues. After a move across the country, his parents work selling and promoting his mother's paintings and sculptures. Ari's bohemian mother needs space to create, and his father is gone for long stretches of time on "sales" trips. Meanwhile, Ari makes new friends: Pick, the gamer; the artsy Jorge, and the troubled Lisa. He is also relentlessly bullied because he's overweight, but he can't tell his parents—they're simply not around enough to listen. After an upsetting incident, Ari's mom suggests he go on a diet, and she gives him a book to help. But the book—and the diet—can’t fix everything. As Ari faces the demise of his parents' marriage, he also feels himself changing, both emotionally and physically. Here is a much-needed story about accepting the imperfect in oneself and in life. Chris Baron is a professor of English at San Diego City College. He's also the author of the (adult) poetry collection, Lantern Tree, which was published as part of a poetry anthology, Under the Broom Tree, winner of the San Diego Book Award. He lives in San Diego, California, with his wife and their three children. 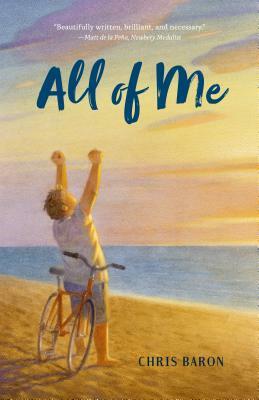 All of Me is his first novel.